BLEMISH (verb): To scar or spoil - Bad associates blemished his character; (noun): A disfigurement, defect - a character without a blemish. 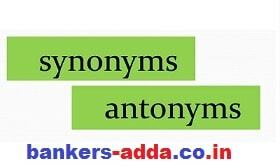 Antonyms: dejected, forlorn, abject. BOG: A swamp - sank into the spongy bog. Synonyms: morass, fen, quagmire, mire. BOORISH: Unrefined in speech or manners - exhibited the boorish manners of a backwoodsman. Synonyms: churlish, uncouth, uncultured, crass. CACOPHONOUS: Unharmonious sounding - a cacophonous blare of trumpets, noisy and discordant. Synonyms: dissonant, discordant, blatant, strident, raucous. CALLOUS: Unfeeling or insensitive - made callous by long suffering.